I recently moved to NYC and see an almost daily trend of guys wearing sneakers with suits!?! From time to time, it actually looks kinda cool. But more often than not, it's a billowy business suit with goofy, technical-looking cross trainers that I wouldn't even wear with jeans let alone slacks. Here are five basic rules of the road I've observed for pairing sneakers with suits in a way that actually works. You gotta start off with the right sorta suit. A suit and sneakers doesn't just work with any cut. From what I can tell, it really has to be a very tailored jacket with form-fitting, cuffed pants. It also can't just be a standard dark, flat-colored business suit. Kicks go best with lighter, textured fabrics. Men's Style Pro nails the look. Your grubby gym shoes are not gonna cut it. The best way to pull this look off is to stick to the classics. Vintage, retro, or reissued running shoes are the safest bet. Classic skate sneaks or indoor soccer shoes work too. The Bespoke Dudes get it right. Pair your sneakers with some fancy, colorful socks or better yet, just go sockless. (Wear hide-a-socks if you must.) Do not pull out your white tubes or black dress socks… even if they have gold toes. 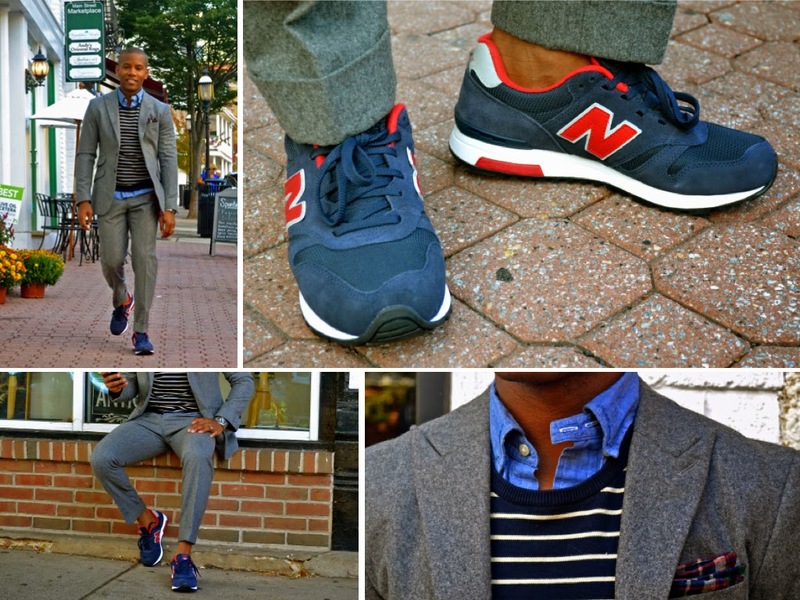 Adding sneaks to a suit brings an overall sportiness to your look. Compliment that sporty vibe with the right kind of accessories, whether it’s a hat, scarf, or matching iPad sleeve (above)—let people know you’re on the go. 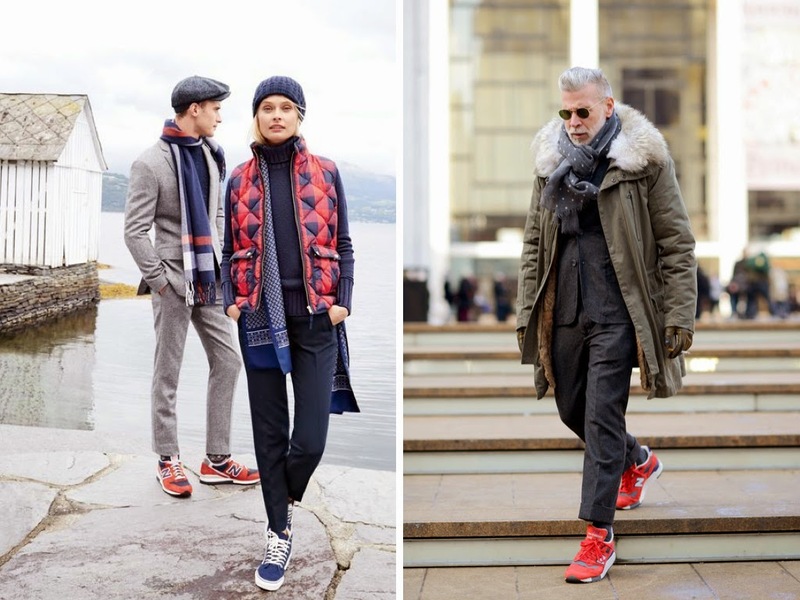 And of course J.Crew and Nick Wooster both know what's up. 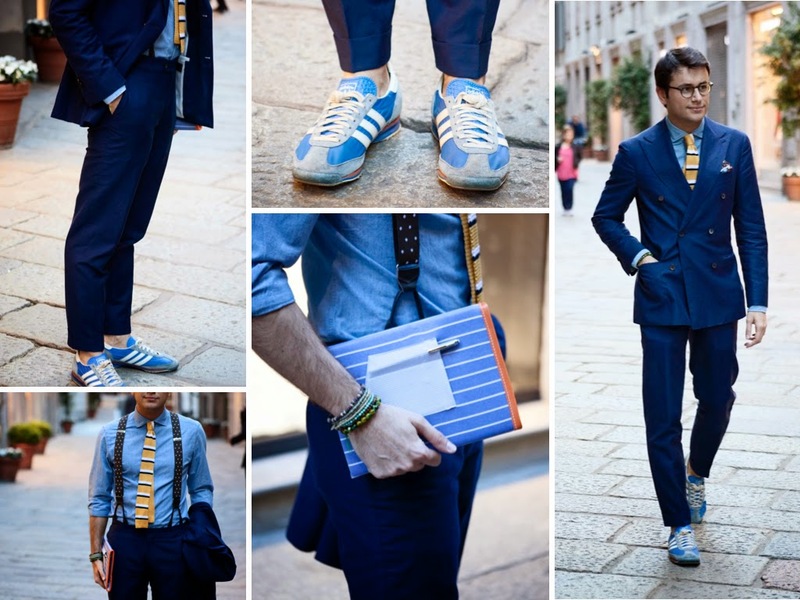 By wearing sneakers with your suit, you’re entering into a brave new world of men’s fashion where relatively few have trodden. Follow these rules but most importantly, be confident. Wear them with a sly smile and jet around in some serious street style. There’s a dude on my train platform who wears a checkered pair of classic Vans slip-ons almost every morning. And thanks to his heather grey tailored suits, the right accouterments, and that just-gonna-own-it attitude... he pulls the whole look off flawlessly. So give a suit and sneaks a shot, just stick to the rules so you don’t end up lookin’ like these guys.